As technology becomes deeply integrated into every aspect of our lives, we...ve begun to expect more emotionally intelligent interactions. But smartphones don...t know if we...re having a bad day, and cars couldn...t care less about compassion. 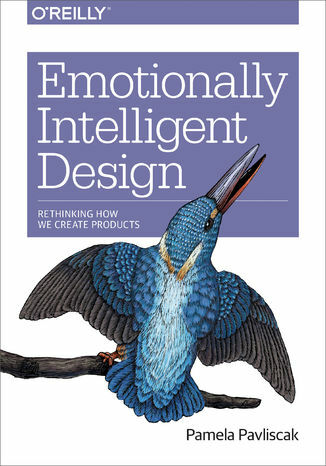 Technology is developing more IQ, but it still lacks EQ.In this book, Pamela Pavliscak-design researcher and advisor to Fortune 500 compan ies-explores new research about emotion, new technology that engages emotion, and new emotional design practices. Drawing on her own research and the latest thinking in psychology, neuroscience, and behavioral economics, Pamela shows you how design can help promote emotional well-being.You...ll learn:How design has transformed emotion and how tech is transforming it againNew principles for merging emotional intelligence and design thinkingHow to use a relationship model for framing product interactions and personalityMethods for blending well-being interventions with design patternsHow emotional resonance can guide designers toward ethical futuresImplications of emotionally intelligent technology as it scales from micro- to mega-emotional spheres Ebook porusza temat Emotionally. Jedną z istotnych spraw poruszanych w ebooki jest: Intelligent. Jeśli interesuje Cię: Design, to ebook dla Ciebie. Dużo wiedzy na temat: Rethinking w formacie EPUB, MOBI i PDF. Hasło przewodnie tego ebooka to Create. Jeśli szukasz ebooków o: Products, to jest pozycja dla Ciebie. ISBN 9781491953099. Porównywarka cen ebooków, które dostępne są w formatach PDF, MOBI i innych. Na urządzenia Kindle i inne. Tutaj znajdziesz ebook, którego szukasz. Nie wszystkie ebooki w ofercie są darmowe. Wspierajmy autorów i kupujmy ebooki.